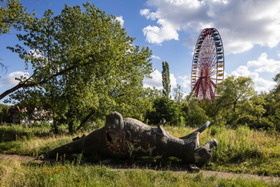 Opened in 1969 as "Kulturpark Berlin" the Berlin Spreepark stretched across an area of 29.5 hectares and welcomed up to 1.7 million visitors every year. It was the only permanent amusement park in the GDR until the fall of the Berlin Wall. From 1991, the showman Norbert Witte led the park and gradually transformed it into a theme park based on the Western model. After the bankruptcy and the final closure in 2001, the Spreepark was left abandoned. Over time, decay, vandalism and the recapture of nature have created a very special place. On a guided tour, you will have the opportunity to visit parts of the enclosed park and experience its enchanted atmosphere. During the 90 minute walk our guides will inform you about the historical development of the place as well as the current state of planning.